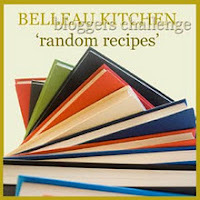 This month Dom of Belleau Kitchen has asked us to use our birthday as a way of selecting the book for his Random Recipe challenge. So that's the number eight. Strangely the eighth book on the first three shelves that I selected turned out to be a book that I'd already used in the Random Recipe challenge and so I tried the pile of books known as ‘the pile that I'm not quite sure what to do with for the moment’. Book number eight turned out to be ‘The Edmonds Cookery Book’. It’s unlikely that I'll ever get to New Zealand to confirm it but I'm led to believe that this book is a bit of a national institution there. It was first published in 1907, has never been out of print (although it has been regularly updated) and at one time it was given away free to any couple announcing their engagement. My copy was printed in the 1990s (a fair bit after my engagement) and how I came to own it remains a mystery. The book is bursting at the seams with straightforward, everyday recipes and on opening it I was faced with the recipe for Madeira Cake. This seemed a little disappointing at first but a random recipe can’t always be an unusual recipe and so I just got on with making it. Then, as the smell of baking filled the house, I realised that I hadn't eaten a homemade Madeira Cake for over 30 years and, what's more, it really is a very good, classic cake. I could pass on the Edmonds recipe for Madeira cake but, to be honest, it’s just a basic Madeira cake. If you don’t already have a favourite recipe, this version on the BBC food site by James Martin is very similar to the Edmonds cake and tells you everything you need to know. (Mr Martin does decorate the cake, which, for some reason, never seems quite right to me). So this month the Random Recipe challenge has reminded me that it's too easy to forget the classics and that there are very good reasons why they became classics in the first place. I do remember making this kind of cake in the 1960s using a large ceramic bowl and a wooden spoon and so it's also reminded me what a pleasure it is having an electric mixer with a beater attachment. The cake is great with tea but do try a slice with a little sweet or fortified wine if the mood takes you – that’s why it's called Madeira cake, after all. I posted my recipe for classic canelés (well, probably not that classic) a while ago but recently I saw some chocolate canelés for sale in an upmarket patisserie and I couldn't resist the challenge of trying to make some. I've stuck fairly closely to my old recipe but with the addition of chocolate, of course. I compared the originals to crème brûlée in cake form – well, the chocolate versions are more like portable chocolate fondants. Canelés have the reputation of being difficult. They aren't difficult to put together and they certainly aren't difficult to eat. I think the only tricky bit is judging when they’re baked to perfection. The chocolate version is darker in colour and that doesn't make things any easier. In my opinion, the best way of telling when they’re ready is to press them very lightly – if they feel soft but gently springy, then they should be fine. I generally prefer to make small versions of canelés using silicone moulds, which are certainly not traditional and won’t meet a true pâtissier’s standards but they’re really easy and quick to use. Mould sizes vary quite a bit, but, based on the most common sizes that I've come across, this will make up to 50 of the small canelés or around 18 of the larger size. Silicone canelé moulds have proved a little tricky to find at a reasonable price outside of France but, if you live in the UK, Lakeland have recently started to sell a small silicone canelé mould (I've not tried it, so I can’t be certain about its performance). They call it a ‘Pretty Pudding’ mould. Like all canelés, these are at their best within an hour or two of coming out of the oven. Make a batch of these for chocolate-loving acquaintances, serve them up as soon as they’re cool and you’ll have friends for life. Place the milk, butter and vanilla in a saucepan and put on a gentle heat. Stirring regularly, bring the mixture up to boiling point and immediately take off the heat. Add the chocolate pieces and stir to dissolve. Set aside and allow to cool a little. Mix together the flour, sugar and cocoa powder – ideally in the bowl of a stand mixer. Add the eggs and yolks and begin whisking them in. Keeping the machine running, gradually pour in the milk mixture followed by the rum. You should end up with quite a thin batter without any lumps. Pour the batter into a jug, cover and put in the fridge for 24 hours. The next day, preheat the oven to 210°C. If you’re not using silicone, then butter the moulds. Whisk the batter briefly and pour into the moulds, filling them about three-quarters full. Bake small canelés for around 35 minutes and the larger ones for around 45 minutes. Allow the canelés to cool in their moulds for at least 10 minutes before attempting to remove or they may collapse.